If versatility and excelling no matter what the challenge are defining characteristic of a strong athlete, it’s safe to say Conrad Stoltz is as tough as they come. Unless you’ve lived under a rock for the past decade you’re probably aware that the “Caveman” has been nearly unbeatable on the off-road triathlon scene. His prowess on the mountain bike often leaves Olympic gold medalists and former Tour de France champions in the dust. In an off-road event its not just the brute strength of the rider, but also their technical aptitude that separates them from the rest of the field. This leaves some to wonder if Conrad’s success lies in his physical strength or his bike handling – or some combination of both. An analysis of a power file from his most recent on-road Olympic distance triathlon helps to answer this question. On August 26 Conrad took on some of the best mid- and short-course triathletes at the REV3 Maine Olympic distance triathlon. Current and two-time Wildflower champion Jesse Thomas and current REV3 leader Richie Cunningham were just a few of the top contenders that comprised a competitive field. Due to the nature of the event and specialization of the athletes, most domestic off-road triathlons do not have the swim times that a typical Olympic distance boasts. However, in Europe or the Xterra World Championships Conrad has been in the mix with fast, draft-legal athletes so there was little surprise when he exited the water with the front pack in Maine. Onto the bike, his plan was to average 420 watts for the ride. At 83 kg thats roughly 5.1 watts/kg for 60 minutes, which based on our Tour de France race analyses is enough to stir things up in the highest levels of pro cycling. Although accustomed to riding strong over rolling hills from his time spent in Stellenbosch, South Africa, the rough road conditions and out and back course of this race forced Conrad to spend more time than anticipated freewheeling, and he “only” averaged 403 watts, still 4.9 watts/kg and good enough to have the fastest bike split of the day, with an 80-second advantage over #2 on the bike, Jesse Thomas. This is a commanding performance. But perhaps this 80 seconds could have been 3 minutes if the hills were greater and Conrad could use his strength at lower cadences, or if there were even more technical turns that put everyone else on the brakes while he drifted through at top speed. Below is the ride file that shows Conrad’s riding skills and strength. There were three points in the ride where his speed exceeded 38 mph and he was forced to “coast.” Also shown are the various points on course that required athletes to navigate 90-degree or greater turns. Using his superb bike handling skills, Conrad was able to carry 25 mph through these turns, and roll through areas where other athletes need to grab handfuls of brake. Had the REV3 Maine course been flatter or included longer climbs, Conrad would have been able to hold a more consistent power output. And if the course included even more turns, his average power may have been lower, but his ability to hold speed through technical sections would have rewarded him with a greater margin over the competition. Regardless, a dive into his power file shows that if someone is looking to out-ride Conrad, they’re going to need a motor. Once off the bike he had several class runners close behind and could not rest on his bike split. Eventual winner Jesse Thomas and Kaleb Van Ort were chasing. Both had impressive collegiate running PRs and have done well the last few years to translate these times into top runs off the bike. Although passed mid-way through the run by Jesse, Conrad was able to fend off a hard-charging Kaleb for 2nd place. Conrad uses TrainingPeaks to track his workouts, analyze his device files, and plan his training to peak for key events. Learn about how TrainingPeaks can take your training and racing to the next level at trainingpeaks.com. 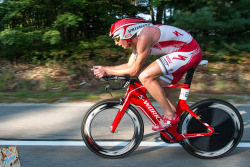 Dan McIntosh is a professional triathlete and coach. Like many triathletes, he was inspired by coverage of the Ironman World Championships. After racing several half and full Ironmans, including the 70.3 and Ironman World Championships,'he changed his focus and is targeting the 2016 Olympics. 'He'attributes'his success in triathlon to great'coaches and peers that have guided him over his 9 years in the sport. 'Now that he is'in a position to give back to the sport, he works to'help aspiring'champions as well as newcomers'reach'on their own goals.